Photo courtesy of the George A. Lange Collection. At the southern end of Kingsley Street, between Lake and Cookman Avenues in Asbury Park, New Jersey, is a 36,000 square foot graveyard of memories. Until May of 2004, a building stood here, perhaps the most identifiable landmark on the Jersey Shore. Then, as dawn rose over the waterfront, developers used a giant mechanical claw to rip apart 116-year-old walls that had survived it all - hurricanes, fires, abuse, neglect, all, that is, until falling at the end to a combination of politics and greed. Photo copyrighted by Peter Szikura. For 100 active years, those wooden walls anchored Palace Amusements, a place where people came to spin, to fly, to literally soar through the roof, to rediscover delirium and to laugh at fright, a place of creativity and ingenuity, ever changing, ever suited to the tastes of generations that were confronting great shifts in the world around them. This place, this Palace, expanded over time to become an L-shaped arcade in five parts, all under a series of interconnected roofs. Its carousel bore the signature of America's greatest carvers of wooden carousels. The rotating wheel carried passengers for more years than any Ferris wheel in American history. Some of the best known and most creative amusements manufacturers in the world infused the Palace with excitement and fun. Designers, painters, mechanics and electricians - enormously talented and largely anonymous - turned six dark rides and two fun houses into shriek-inducing classics. The Palace excited ten decades of visitors, and inspired a generation of New Jersey songwriters, photographers and artists. Photo copyrighted by Frank Saragnese. To fans, it was a palace of dreams, a wonderland. Families planned summer trips to the Palace. Teenagers used their beach money on the rides. Couples loved the dark rides and the Ferris wheel. To them, the Palace was an irresistible destination. 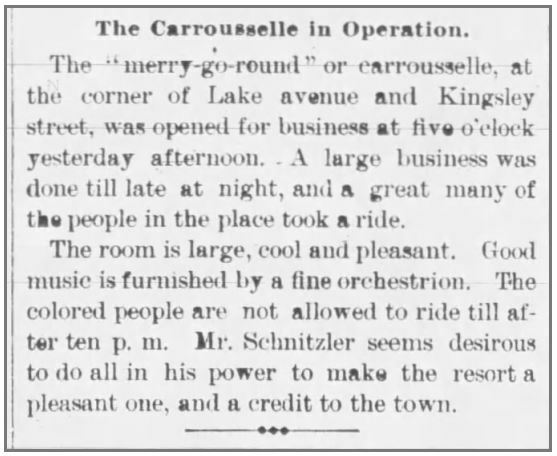 To historians, it was unique, a timeless place that reflected the evolution of America's amusements industry. In 2002, Dorothy P. Guzzo, the State of New Jersey's senior historic preservation officer, reminded Palace owners that the complex was listed on the New Jersey and National Registers of Historic Places, and expressed her office's official position that "if saved, this complex could serve as a major tourist attraction as it did historically and be a cornerstone to the redevelopment plan of Asbury Park." Yet sadly the first instinct of the developers was not to save and renovate, but to tear down, to destroy and to let nothing stand in the way. So it was that on May 26, 2004 - less than eight hours after preservationists approved new strategies to save the Palace's most historic sections - Asbury Partners, an out-of-town group of developers fronting for New York financiers, rushed in their giant mechanical claw and suddenly brought the walls tumbling down, leaving us with the following memories.